Not Michigan-related, but, you know, it's May 5. So after yet another overtime loss, the Red Wings find themselves in a 0-3 hole to the nemesis San Jose Sharks. Last night's game was not unlike any of the other overtime losses the team has suffered in the last decade, but it was enough to finally make me ask, Just how bad are the Red Wings in playoff overtime games? So I decided to do a little digging and see whether or not my beliefs (that the Wings simply cannot get it done in overtime) actually align with reality. NHL.com has the result of every game dating back to the 2003-2004 season*. I was hoping to look at games beginning in 2000, but only to make numbers round and aesthetically pleasing. The following are individual teams' overtime record by year, followed by their composite record over the time span. So... yes, the Red Wings are very bad in overtime playoff games. The team is 6-11 over the time period, which is a .353 winning percentage. During the regular season over that time period, the Wings are winning at a .613 clip. 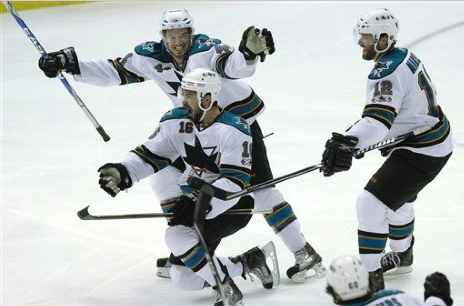 The Sharks have played in more playoff overtime games (22) than any other team. The next closest is the Wings with 17. Unfortunately, the Sharks are 12-10 and the Wings record is... what it is. Then again, heading into this postseason, the Sharks were 7-10 in such playoff OT games. With the exception of Nashville (2-4) the Wings have the worst playoff overtime winning percentage of any team that has played in more than 5 playoff OT games. The gut wrenching feeling you get every time the Wings go to OT is a valid one. Boston has the best playoff OT record of any team that has played more than 5 games, clocking in at a scorching 10-3. As you can tell (and as you might expect), most teams hover around the .500 area. The question is whether or not specific play styles lead toward a better or worse OT record, but that's something I don't have the time or resources to investigate. In any case, you can feel safe saying that the Wings are an awful playoff overtime team, especially when you take into account their record, seeding, and likely the lesser competition they're playing in those games. *The 2004-2005 season never happened because of the NHL lockout.